She's Fantastic: Kamen Rider - BEE WOMAN (HACHI ONNA)! Instead of packaging, these 6-7" vinyl figures usually have a cardboard hang-tag with a plastic hook in order to hang from the pegs. 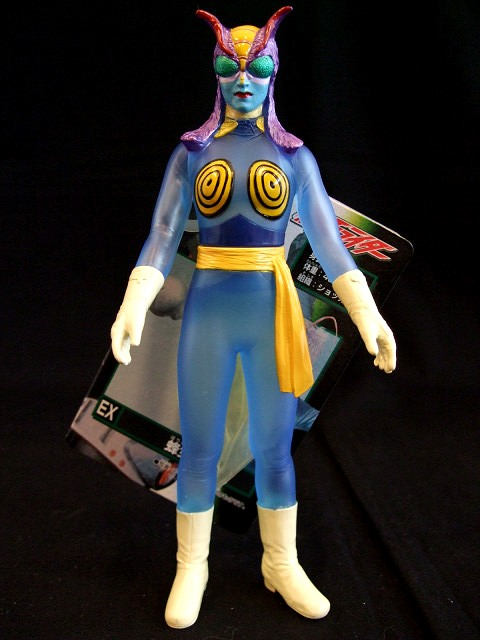 Bee Woman also came in a translucent version. Here are a couple images from the Movie. Bee Woman is only articulated at the shoulders. These figures are usually articulated at the neck as well, but her hair eliminated the option for this figure. Shes is so bizarre! I love her. Must have! Thanx again for inspiration! Hooray! Just got the last one on ebay, with two other characters. Three makes a collection, right? Haha!. That does indeed make a collection! I actually have a ton of these vinyl figures that I'm just about to put on display after years in storage. I can't wait to review more of them. Haha I've seen that little version in auctions before. It's so bizarre. 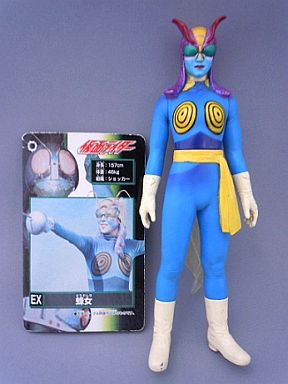 Despite her role on the show being very small, Bee Woman had a pretty big impact on Japanese popculture. Nearly every bee-themed female character after her drew inspiration from her design. She is pretty much the Japanese Catwoman! That's awesome information. It makes me want to hunt down the other figures of her I've seen. Comparing her to Catwoman was like opening the floodgates of my obsessions haha.